The Dell 2355dn is a user-friendly multifunction device aimed at small and medium-sized offices. It can be configured to print wirelessly and it has built-in fax, but problems like mediocre text quality, bulky frame, and the limited paper support make it less versatile for busier and more demanding workgroups. The Dell 2355dn has an imposing appearance with its 20Kg plastic frame that measures 18.3 inches wide, 18.1 inches tall, and 17.5 inches deep. Its centrepiece is the 4.3-inch colour touchscreen beside the simplified operational keys. There is a built-in duplexing, automatic document feeder that can handle 50 sheets in addition to the standard 250-sheet standard input tray and the 50-sheet multipurpose feeder. The output bin can handle a maximum of 150 sheets, while single-sheet output is at the back of the printer. The 2355dn runs on 256MB of RAM, which is upgradeable to 512MB, while the connectivity options are via either Ethernet or USB 2.0. (an RJ-11 port is also included for the fax machine connectivity). 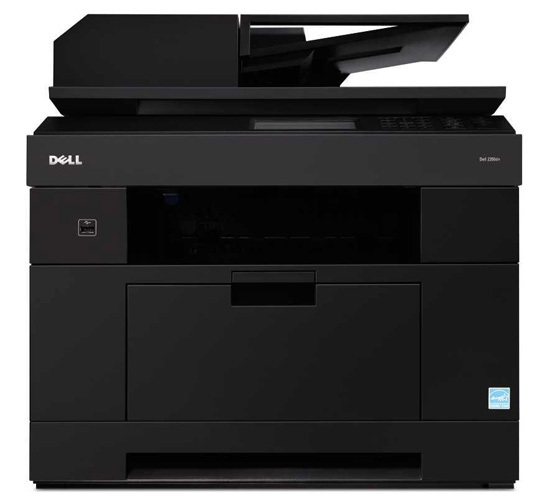 Touchscreen operation, two-sided printing capabilities and easy maintenance with an all-in-one cartridge are the main benefits of the Dell 2355dn. It is can function as a standalone fax machine and copier. The Dell 2355dn can scan, fax, and print over a network, too. The print speed is fast enough at 35ppm. Text prints are a little faded. The large footprint of the Dell 2355dn tends to take up unnecessary space in the office desk. Paper that is only up to 90gsm can be handled by the Dell 2355dn. This device could be better if it had a larger display screen and had the option of changing the screen viewing angle.